I love the look of richly stained wood, so when I started embroidering I knew I wanted to stain my hoops. All the hoops I buy come unfinished and If I'm going to spend hours creating a piece of art I want it to be framed in something that compliments it. I'm weird and actually enjoy staining the hoops. It's a bit stinky and messy, but I love the finished result, plus I can catch up on my MFM podcasts while I work. My husband's old sock (not pictured) - cloth works best for applying the stain and my husband's old holy socks are sacrificed for a good cause. 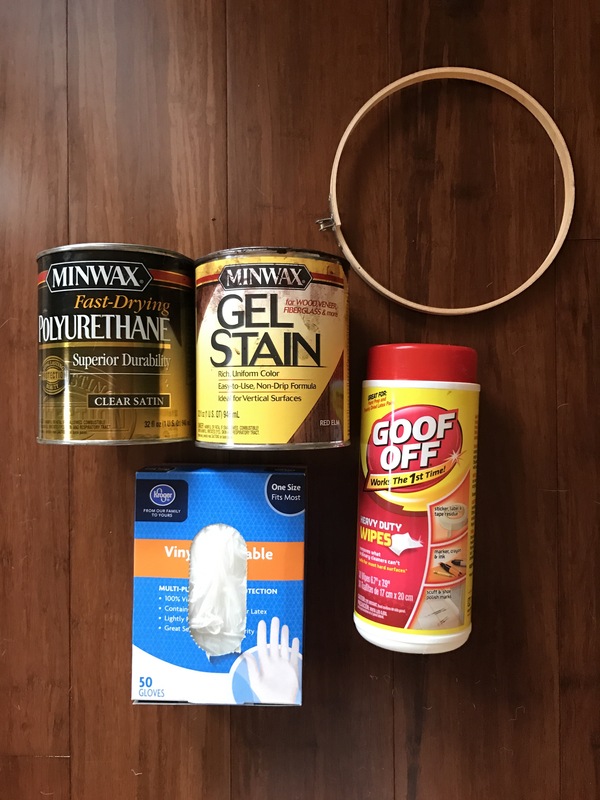 Minwax Gel Stain - I've tried ALL the stains (I have a crazy collection in our garage) and this is my favorite for hoops. It goes on easily and the coverage is uniform. Don't use this on already stained hoops because it won't soak into the wood. For already stained hoops, use a stain + poly blend. It works more like a paint than a stain since it sits on the wood rather than being absorbed. Minwax Polyurethane - This is what you apply after the stain to seal the hoop. If you don't seal your hoops the stain can transfer from the wood onto your beautiful embroidery work. If you want to learn more about how I stain my hoops check out my embroidery patterns or kits which include full how-to instructions.